Premium audio company Bose and Apple-owned Beats Electronics disclosed on Friday that they have settled their patent infringement dispute out of court, preventing a potential trial between the two competitors. 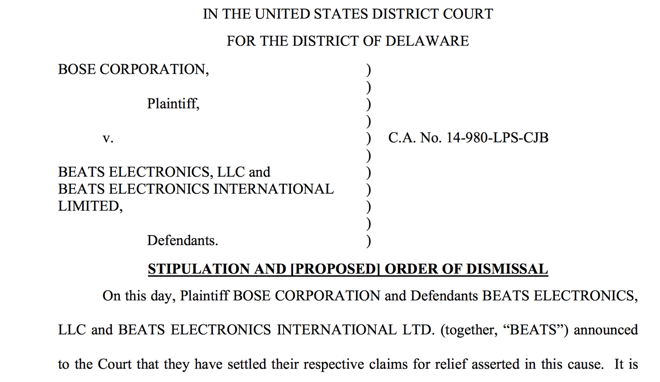 Bose, who first filed the complaint in July, disclosed to a U.S. District Court in Delaware that it has dismissed its patent infringement accusations against rival Beats. The terms of the settlement were not disclosed. Previously, Bose had accused Beats of infringing upon five noise-canceling patents used for its QuietComfort branded headphones. In the original complaint, Bose alleged that the Beats Studio and Studio Wireless headphones, featuring "adaptive noise cancelation," were infringing products. The news comes the same day a new rumor claimed that Apple plans to remove all Bose audio products from its retail stores beginning next week. No reason was given for the alleged split between the two companies, but with Apple's $3 billion purchase of Beats earlier this year, the two companies do compete in the premium-priced audio accessory space for both headphones and speakers. The growing rivalry between Bose and Apple is also playing out in the National Football League, where players have been barred from wearing Beats headphones in postgame press conferences. Bose is the official audio partner of the NFL, and NFL rules dictate that players cannot promote unsponsored products when conducting interviews, including 90 minutes following the end of a game. The issue took the spotlight this week when it was revealed that San Francisco 49ers quarterback Colin Kapernick was fined $10,000 for wearing a pair of pink breast cancer awareness-themed Beats headphones at a press conference last Sunday.